Can I tell you how much FUN this card was to make? For days it seems I had designer's block and couldn't get past it. I was starting to worry! How could my "juice" have dried up? Well, I'm happy to report that this little charmer broke through the fog. It all started with some cheerful lime green dotted card stock in 8-1/2x11. Once I split the piece in two and printed my logo on the backs of each, I was off and running. 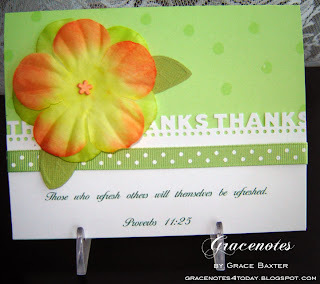 I had a thank-you card in mind but needed a sentiment for the front. As usual, I turned to my Bible. There are not very many verses that speak about hospitality but there are several that talk about being kind to others, reaping what you sew and loving your neighbour. Then I landed on the PERFECT sentiment. Those who refresh others will themselves be refreshed. Proverbs 11 verse 25. Right away I knew this card should be one that a guest might give to their hosts after spending a lovely over-night stay with them. With so many people travelling and visiting throughout the summer, this type of card would come in very handy, over and over again. I almost feel guilty being this pleased with it because it was so simple to make! 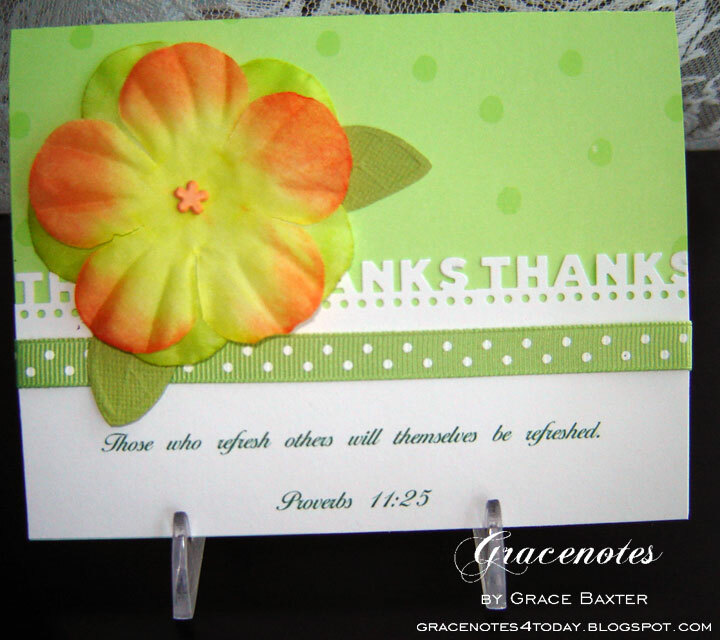 The sentiment was first printed on white card stock, then punched with the Martha Stewart "Thanks" punch. This is my first time using the punch and I know I'll be pulling it out a lot more often. The flower was another easy-as-pie creation. I used a couple of silk flowers that were from a dollar store lei that had straw separators between them. Once I cut the thread and pulled off all the petals, I was amazed at how many flowers I had, in all different colours. 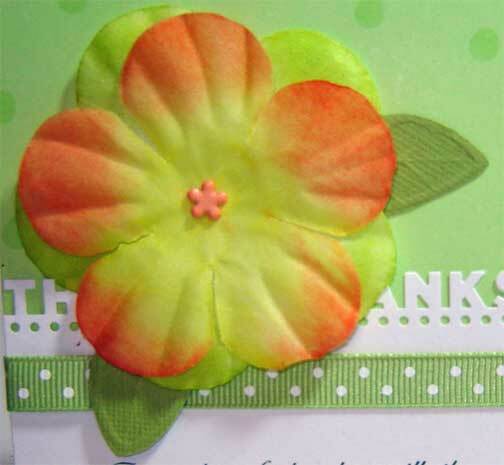 The orange and green are particularly tropical... just right for summer and harmonize with my card stock. 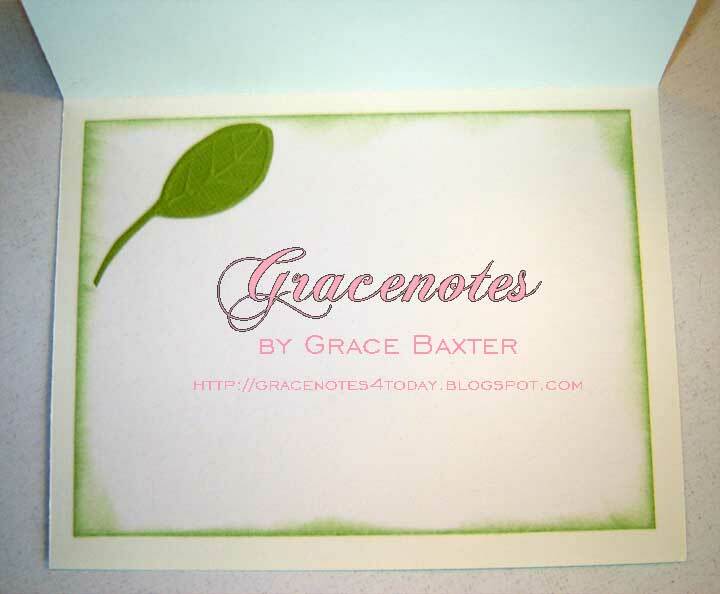 The leaves are cut from embossed card stock that came that way. A flower brad in the centre and a pop dot underneath anchors the whole thing. One more thing... for those of you who don't use a Cricut or Cuttlebug to do your crafts, this card was made totally without their help. I did however use my computer for the verse on the front.